Ronan City Public Works Director Dan Miller shows folks a highway expansion map. RONAN – With fresh eyes, folks from outside the town are evaluating its strengths and weaknesses to create an assessment for improvement. The Greater Ronan Resource Team Assessment was conducted by a crew with members from all over the state. They held a town hall meeting to share their findings about the town with the public on Tuesday, May 10. The team is part of a nonprofit organization that promotes economic development in Montana and is sponsored by the Montana Department of Commerce and the Montana Economic Developers Association. The evaluation team took information from town tours and public comment to make their conclusions. They also have years of experience in evaluating towns and knowledge of economic development. Polson went through the evaluation about 10 years ago. 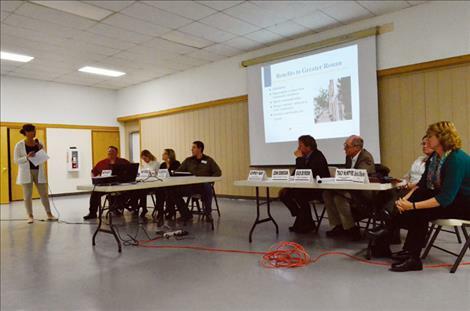 The Lake County Community Development Corporation invited the assessment team to Ronan. The Ronan Chamber of Commerce supported the project along with the Confederated Salish and Kootenai Tribes, City of Ronan, Lake County, St. Luke Community Healthcare, MSU Extension Lake County, Ronan School District and SKC. 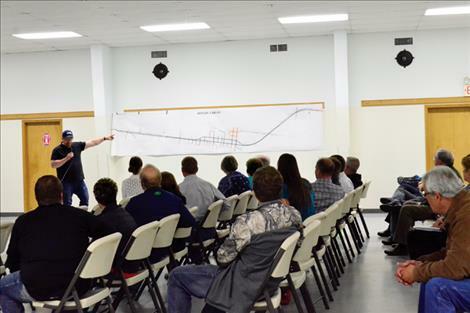 The project started after many chamber of commerce members talked earlier this year about the highway construction project that will go through town. It isn’t scheduled until 2018, but some of the local folks are considering its effects. “We started talking about the impact the highway could have and what it would do to business, recreation, and services in our community,” Ray said. Discussion about the highway sparked another concern. “We knew that this was bigger than the highway,” she said adding that revitalizing the town has become a priority for many folks. The assessment team asked community members three questions: what are the strengths and assets of your community, what are the challenges, and what projects should be addressed? The assessment team toured the college, public schools, library, airport, and many other facilities. They also attended a river honoring ceremony held by local tribes. The good news was discussed first. It was reported that people in the Ronan area are friendly. “You guys really like each other and we’ve experienced it,” Tracy McIntyre said. She is a part of the assessment team, and her focus is on rural economic design. She added that the area has a great natural environment, rich cultural heritage, diversity, close proximity to a highway, and rich agriculture production. Other members of the eight-person team along with local coordinators stood up to report the challenges the community faces include access to housing, a declining tax base, lack of funding, and although people like each other, they don’t seem to collaborate, but people shouldn’t be discouraged. The team reported that Ronan is a great community, and Main Street might need a coat of fresh paint here and there, but the town has a lot of great assets. The team also reported that many community members felt that the school was a great strength. They mentioned needing better parking for baseball games, and wanting to have a “walkable” community, but it was a great place overall. Housing was another topic of discussion. Community members said that many of the homes in town need rehabilitated. More housing is needed in several areas including low-income, high quality homes, rental homes, and student housing. It was also mentioned that community members would like the county, city and tribal entities to coordinate together on projects. They also want the city government to be open to new ideas, and they want the potholes in the roads to be fixed. The assessment team mentioned a few ideas for development including a made-in-Ronan store, more evening amenities, more activities for youth, and they mentioned focusing on more recreational activities with cultural sensitivity. Montana Department of Commerce team member Alyssa Townsend-Hudders said that the town needs to develop services in several areas including programs for those in poverty, for people with mental health needs, and youth activities. 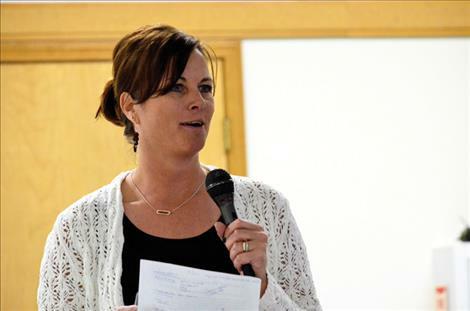 “I’ve heard several times that you need more activities for kids,” she said adding that kids need summer camps and older kids need employment opportunities. People also said that drugs were a problem. “What can I say? Do you want to tackle the problem head on?” she asked adding that people can make drug addiction one of the focuses for a community action plan. The assessment team will take the information they learned from the community write up a report with suggestions and resources. It should be finished by the end of May. The team will come back and share the report on June 8 so that the community can take action. The assessment team from outside the area includes Gus Byrom, planning bureau; Martin DeWitt, business program specialist; Sarah Converse, executive director; John Donovan, economic development; Eric Seidensticker, program manager; Tracy McIntyre, principal; Alyssa Townsend-Hudders, program specialist, and Gloria O’Rourke, team assistant. More information can be found at www.medamembers.org.